Angelica has for centuries been an important medicinal plant and food source, especially to the Sami or Lapps in northern Finland, Norway and Sweden and the Inuits in Greenland. The Vikings were aware of the medicinal properties of the plant, and it is mentioned in the Icelandic sagas. In Norway, the plant was cultivated in medicinal herb gardens, and it was probably the first medicinal plant that was exported from the Nordic countries to the rest of Europe. 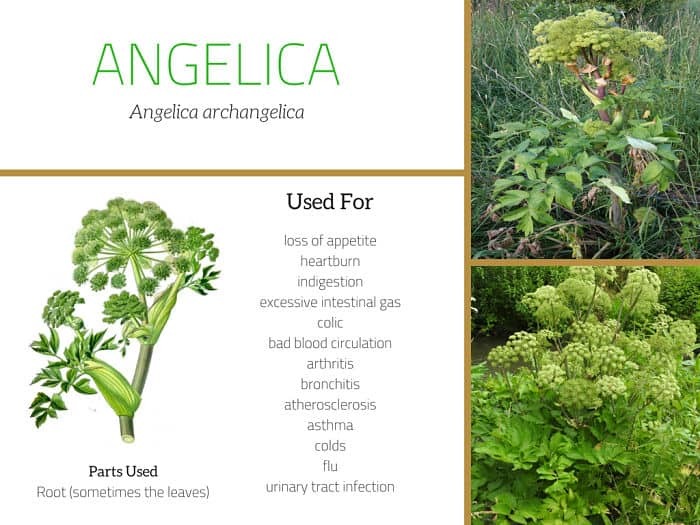 By the 14th century, angelica had become well-known as a medicinal herb throughout Europe. During the middle ages the root of the plant was believed to be useful as a treatment for the plague, and in the 17th and 18th century the herb was widely used against intestinal infections such as dysentery and cholera. What is Angelica Used for? 1 What is Angelica Used for? The applications and therapeutic benefits of angelica are mostly based on traditional and folk medicine uses, but in recent years the herb has gained interest within the scientific community. Today, numerous studies exist that have validated to some extent the herb’s effectiveness for few conditions. 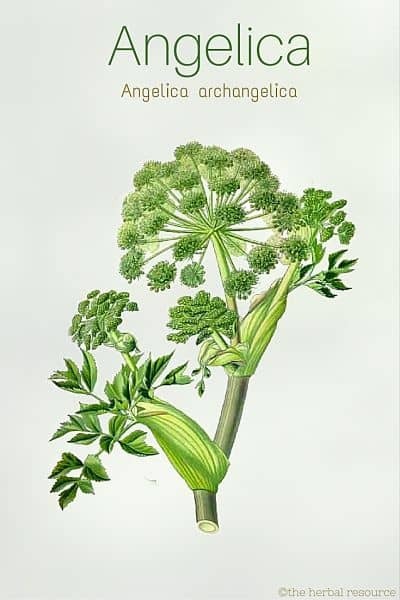 Among modern-day herbalists, angelica is considered a bitter, warming and invigorating herb that can be used as a remedy for a wide variety of diseases and disorders. Because the herb is bitter, it is primarily used for ailments associated with the digestive system. The herb has been used to stimulate appetite, improve digestion, soothe colic and lessen intestinal gas production. 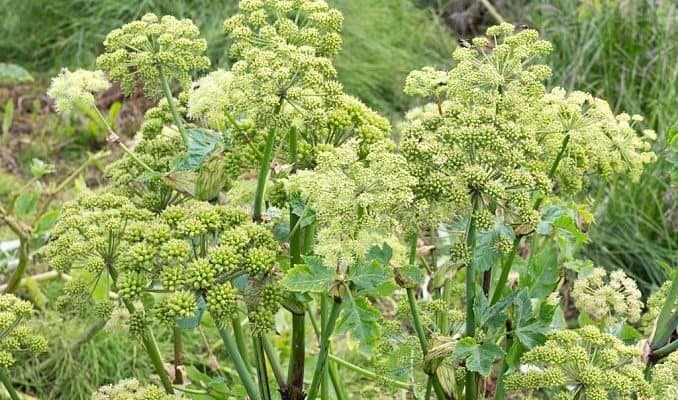 Angelica can also be useful for poor blood circulation, and it has been used as a treatment for Buerger’s disease, a condition that causes the arteries of the hands and feet to become narrow. The plant is known for its expectorant properties and has been used traditionally as an herbal remedy for bronchitis, asthma and other ailments of the respiratory system. It is the roots that are commonly used in this regard, but the stems and seeds may also be used. Also, the plant has antioxidative properties that could make it useful in preventing and treating atherosclerosis. The German Commission E, the German equivalent of the Food and Drug Administration (FDA), approves of the use of Angelica archangelica as a remedy for high fever, symptoms of the common cold, urinary tract infection and dyspeptic complaints. The stems of angelica are edible. They are very rich in nutrients and can be eaten in the same manner as celery. The outer layer of the stems is usually removed, and only the green and juicy inner parts are eaten. They have a strong taste, but if cooked the flavor becomes milder. The plant has been used as a flavoring agent in liqueurs for centuries and is still the main flavor ingredient in the French liqueurs Bénédictine and Chartreuse. The volatile oil is found in all parts of the plant. The root contains phellandrene, terpenes, coumarin and coumarin derivatives (a total of 26 derivatives have been identified) such as osthol, angelicin, and archangelicin. The root also contains bitter substances, glucose, sucrose, saccharine and some organic acids like aconitic acid, fumaric acid, and oxalic acid. The seeds are rich in fatty oils, and the leaves contain tannin and bitter substances. Historically, all parts of the plant have been used as food, spice, and medicine but It is mostly the angelica roots (sometimes the leave) that are used in herbal medicine. The herb has an aromatic smell and bitter taste. The leaves are collected in early summer before the plant blooms. The roots (rhizomes) are harvested in winter when they are most bitter. The roots should be dried at no more than 35 ºC. Since the dried roots readily absorb moisture (hygroscopic), they must be stored in closed containers. When harvesting angelica from the wild it is very important to be sure that the right species is harvested. Some species in the same plant family are very poisonous, such as giant hogweed (Heracleum mantegazzianum) and water hemlock (Cicuta spp.) and can easily be mistaken for Angelica archangelica. As a tea: Add one teaspoon of the dried and finely chopped root in one cup of boiling water and allow it to steep for a few minutes before the tea is strained. As a tincture: The recommended dosage is usually 20-40 drops taken three times daily. Side effects from regular use of angelica in recommended doses are not common. Large doses of the root or the essential oil can, however, be highly toxic. The root is considered somewhat poisonous when fresh and should be thoroughly dried before it is used. Pregnant women or nursing mothers should not use angelica, and it should not be given to children under two years. The herb should not be used internally by people with stomach/intestinal ulcers and diabetes. Angelica grows wild in Scandinavia, Greenland, Iceland, central Europe and some parts in North Asia. It will only grow in damp soil. Angelica is a biennial or short-lived perennial plant that belongs to the Apiaceae family, better know as celery, carrot or parsley family. It can grow up to six feet tall or around 180 cm. The root is thick, fleshy and branched with several small rootlets. The leaves are green, consisting of three parts. Each part produces three serrated and lobed leaflets. The flowers are yellow with a hint of green and blossom from July to August. Angelica is self-fertile as the flowers have both male and email organs which are pollinated by insects. Karalliedde. L. and Gawarammana. I.: Traditional Herbal Medicines: A Guide to Their Safer Use. Hammersmith Press Limited. 2007. Schery, Robert W.: Plants for Man. Prentice Hall, 2nd edition. 1972.